Views from the loch. : How its done! Photo 01 - Stuart with a ten pounder in tip top condition! All Pike anglers know that with the advent of winter and dropping temperatures the Pike become less active and our sport becomes subdued. Weighing in against this is that with the production of eggs the females can put on up to 25% of bodyweight turning a good 16 pounder into a cracking twenty increasing the chances of landing a whopper! Speaking with the chuckle brothers yesterday (Davie & Stuart) it seems that once again they are proving the point that if you put the time in and vary your tactics success is there to be had. Davie lured and landed a fine 12 pounder (photo to come) using a soft rubber eel and also lost a fish on dead bait, mate Stuart Durham also part of the blue tarpaulin squad landed a plump ten pounder in peak condition (photo 01). Well done lads! Photo 02 - Fine sanding still to do! Having a voice or rubber stamping! Late last year our then secretary Alasdair White tendered his resignation from the club! Alasdair was our representative on the River Tweed Commission who look after primarily the Salmon fishing’s in the area. Quite frankly I am not too bothered regarding membership of this forum but we feel it is only right and proper to offer any interested member the opportunity to take this seat. The commission is a group of fishery proprietors (often said to be the real commission) and representatives of other groups who have an interest in fishing. The longstanding view held by angling clubs is that the power brokers meet on the golf course on a Sunday to decide policy, then on the Monday the full meeting is asked to rubber stamp these decisions! I have no idea if this is the case and it may be that indeed there is an opportunity for the ordinary angler to have his say and influence policy. There is a “vetting” process to be completed to weed out angling bully/super chump types but other than that membership is straightforward. Meeting are held on weekdays so if you have difficulty in securing a weekday off then this is not for you. If you are interested drop me a line and I will pass on the relevant information. We would like to extend our grateful thanks to Alasdair for his input into club matters over the years. Photo 03 - sanded back to the original gel coat! I put a few hours in yesterday making a start to preparing the boat for fresh paint by sanding down the previously applied paint to give a key for the new finish. Its hard going even with a power sander but it has to be done. We should complete this work with another session leaving the woodwork fibre glassing work and painting still to be done. 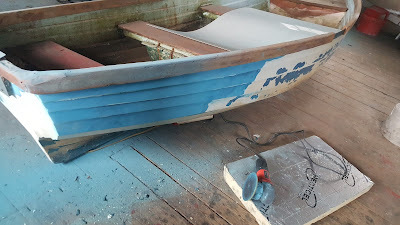 The seats and rim of the boat are ready for varnish but this will be the last task. 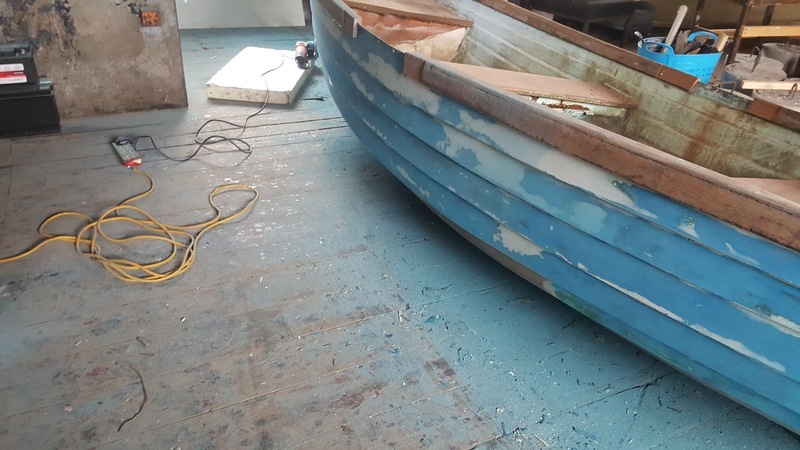 If you have any preferences regarding which colour the boat should be let us know. The options suggested so far are white and a blue similar to the fibreglass gel coat which when chipped as it will inevitably be will not look so unsightly. We had thought we might move the mooring point from the top of the Lowes to a point near the bottom for ease of access but we felt the possibility of Muppet damage was too great, so back to the top it will be. There can be no doubt that the Scottish government are traversing choppy waters at the present time. Education and the health service policy being the most prominent but across the board the shine is coming off the SNP machine! Naturally then one is keen to look at what the opposition have to offer and with this in mind I watched the Tory conference on the TV. There was much cheering and applauding as the Borg Queen introduced would be Thatcher clone Theresa May. The Tories say they are fighting for the people who do not want a second referendum and want the Scottish government to stop banging on about it yet what is clear the referendum is mentioned by the Tories more than it is by the government! There was very little talk about the “Brexit Crisis” manufactured by the Tories plunging the country into economic uncertainty. Instead the Borg Queen reeled off a series of "policies" to right the perceived wrongs of the Scottish government and what did we get? A series of headings with no actual policy details that has yet to be determined! Did you ever hear of such nonsense, a party that claims to be the next government clearly proving they do not even make it as an effective opposition! At least with the government there is some structured thinking even if it needs some tuning. Anyone swayed by the tripe spouted yesterday should not be allowed to vote. We heard nothing of substance merely lofty ideas that will never come to fruition! Yes the Scottish government has lost its shine but the official opposition seem to have no idea of what it takes to run a country. Tory voters need to give themselves a damned good shake because if this lot get anywhere near power we will know the true meaning of the word disaster! The Tories are not an effective opposition just a bunch of well heeled loudmouths seeking to increase their own prosperity! God help us from these fools!